During my trip over the spring break to my home country, Kazakhstan, I had a chance to visit a famous sculpture “The Beatles Bench” which is located on Kok Tobe Park in Almaty city. 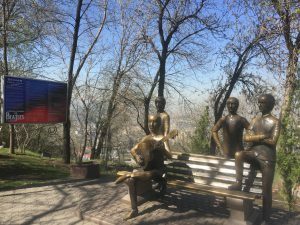 Kok Tobe in Kazakh language means “Green Hill” a mountain which is the highest point of Almaty. 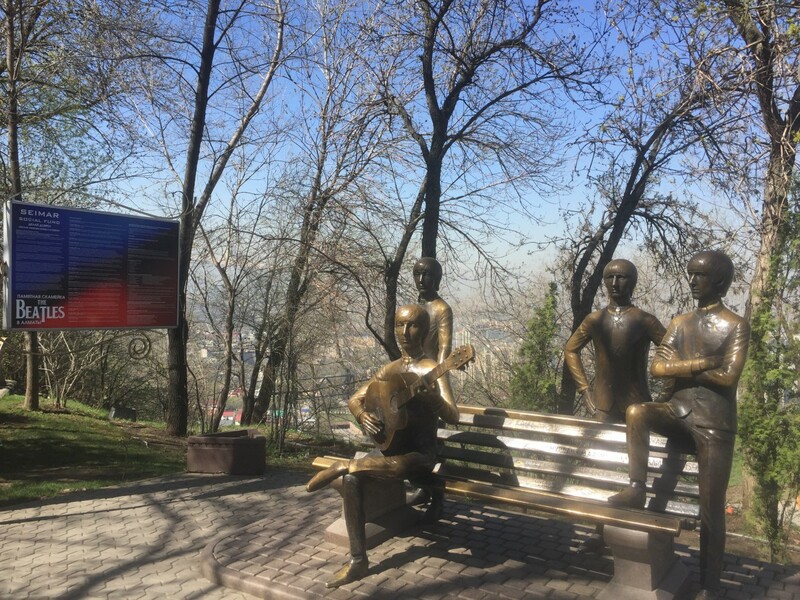 In 2003 Bayanov and Shayahmetov made an initiative group that consisted of people that had a big desire and believed that this monument should be definitely executed. Non-commercial charitable Social Seimar Fund obtained an official permission to build the monument from Frank Roderick , the mayor of Liverpool, from Apple Corp , the Beatles brand right holders from cult musicians – Paul McCartney and Ringo Starr and from John Lennon’s widow Yoko Ono and Harrison’s relatives. 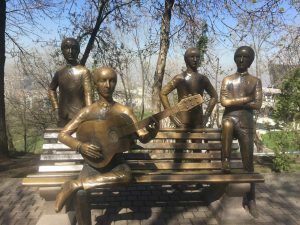 Also this Social Seimar Fund organized a competition among sculptors and architects of Kazakhstan who will execute “The Beatles Bench” monument. The famous sculptor of Kazakhstan, Eduard Kazaryan won this contest and executed this beautiful monument. I am very glad that I had this opportunity to see and take a picture of this amazing sculpture. Personally, I enjoy listening to “The Beatles” songs to this day. I wish I was born earlier and watched their live concert. This entry was posted in Uncategorized on May 25, 2017 by Almagul.